Transformation towards sustainable and resilient societies, in Bankok, Thailand. 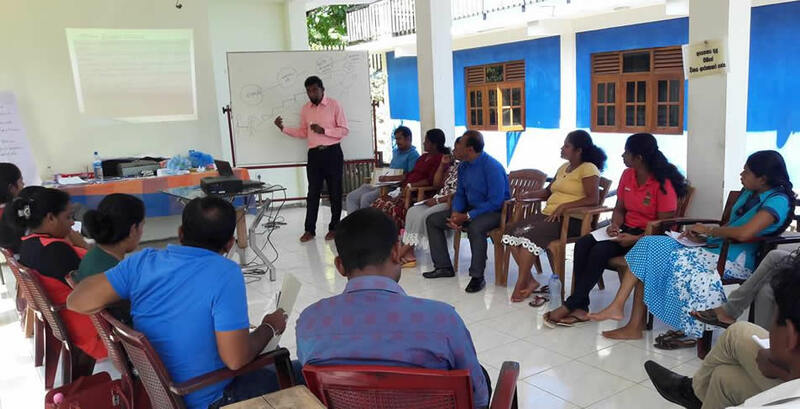 Organised by IDEA, Sri Lanka lLinking Eco Village Development activities with Gramashakthi People's movement together with Matale District Secretariat. More information at the organisers: INSEDA, WAFD and CANSA and at the Eco-Village Development (EVD) Project. Program, Proceedings and Publications are at the Eco-Village Development (EVD) Project. 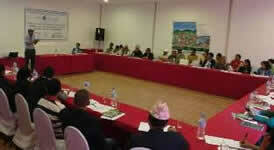 Seminar and Nepalese National Dialogue Meeting on Eco-Village Development (EVD). Read more on the Project and download the Proceedings (1.44 MB, 16 pages, pdf file), which includes introduction, summaries of the speakers, list of participants, and pictures. 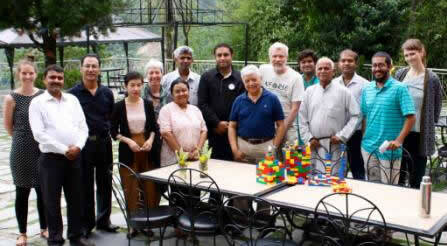 More information: CRT-Nepal and Eco-Village Development (EVD) Project. 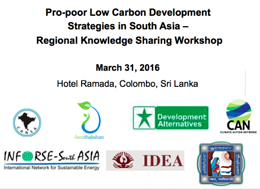 Pro-poor Low Carbon Development Strategies in South Asia - Regional Knowledge Sharing Workshop, Colombo, Sri Lanka. Title: Fair Low/Zero Carbon & 100% RE Strategies, South & North Countries, Villages, including Women's Initiatives - Session on Eco-village Developments in South Asia. 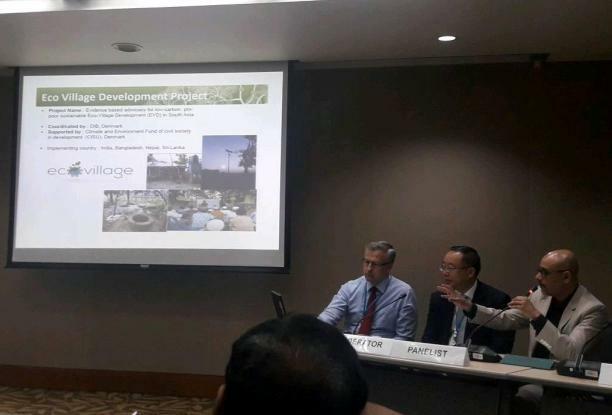 The Session's Proceedings is at: Eco-Village Development (EVD) Project. Workshops on "Low Carbon Development Strategies with focus on women and poverty reduction in India"
Presentations and Debate during the Danish "Mirror of the World" Festival. The Project presented by Kavita Myles from INSEDA, India, on low-energy solutions and eco-villages in South Asia and by Sanjay Vashist from CANSA lobbying for climate action and development on the global political arena. 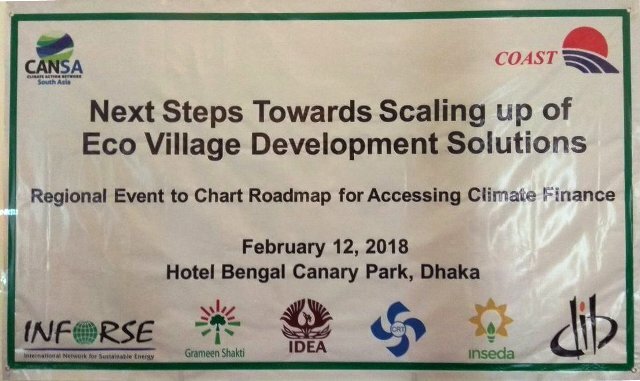 The event was co-organized by the Danish INFORSE member organization, DIB, which is coordinator of the Eco-Village Development (EVD) Project.
" 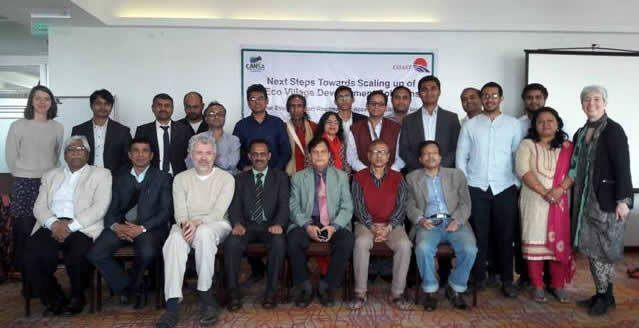 Southern Voices on Climate Change" regional NGO Meetings and INFORSE-South Asia Meetings in Nepal, Sri Lanka, and Bangladesh. __National Networking Meetings in Bangladesh organised by Grameen Shakti. INFORSE participated as NGO observer organisation. INFORSE organised Exhibition and a Side Event. Among the INFORSE-Asia members, the following organisations plann to participate: INSEDA, WAFD, and AIWC from India. 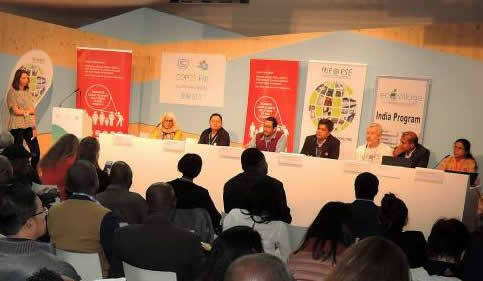 "Southern Voices on Climate Change"
INFORSE participated as NGO observer and organised Exhibition and a Side Event. 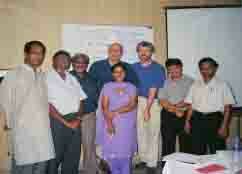 Among the INFORSE-Asia members participated INSEDA, WAFD, and AIWC from India. See more: INFORSE at COP18. See more: INFORSE at COP17. INFORSE participated as NGO observer. 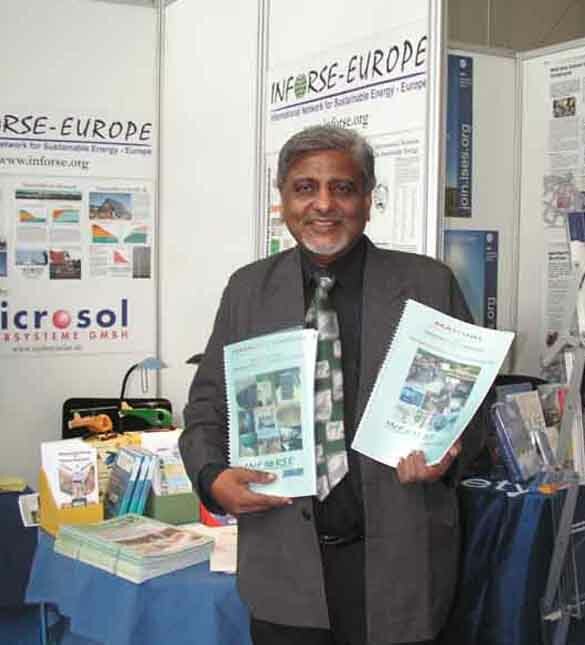 Raymond Myles, INFORSE-South Asia Coordinator /INSEDA, India. See more: INFORSE at COP16. 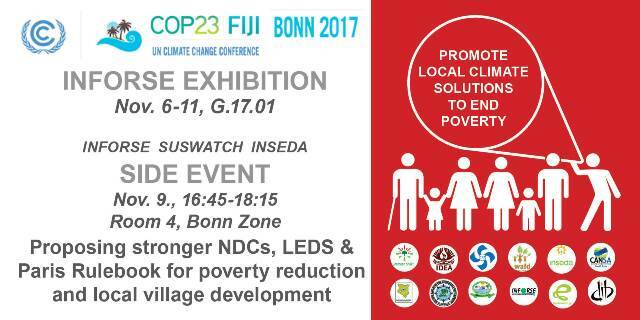 INFORSE organised Exhibition and Side Events both at the Bella Center and at the Klimaforum at the DGI-Center. 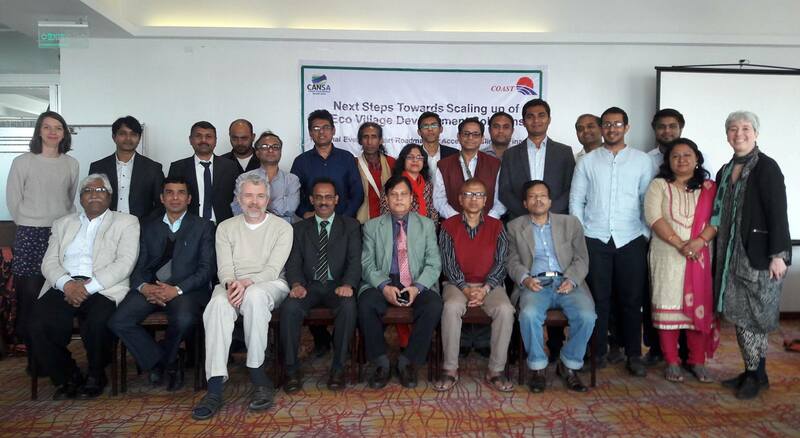 From the INFORSE-Asia Coordinators and National Focal points participated: INSEDA (India), WACF (India), CRT (Nepal), and ISEP (Japan). Read more: INFORSE at COP15. 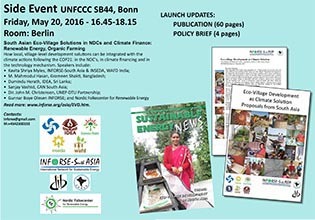 INFORSE organised exhibition stall and a side event. 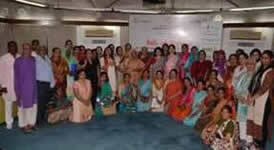 From the INFORSE-Asia Coordinators and National Focal points participated: INSEDA, AIWC (India), CRT (Nepal), ISEP (Japan). Event: UN CSD Conference: INFORSE South-Asia organisations participated on the UNCSD 15, 2007. 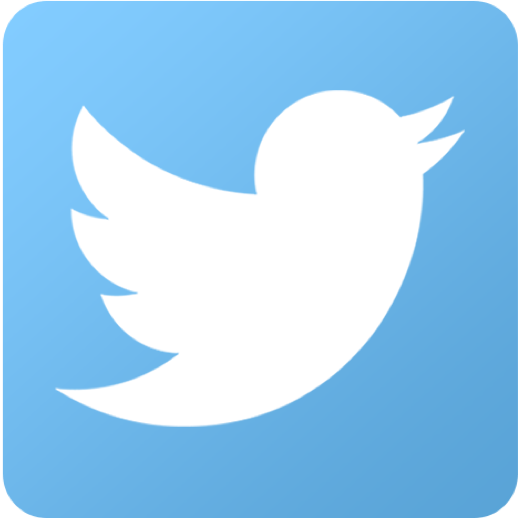 Please read on this here. Event: Starting Meeting and Seminar INFORSE South-Asia Cooperation Project on Sustainable Energy 2005-06. 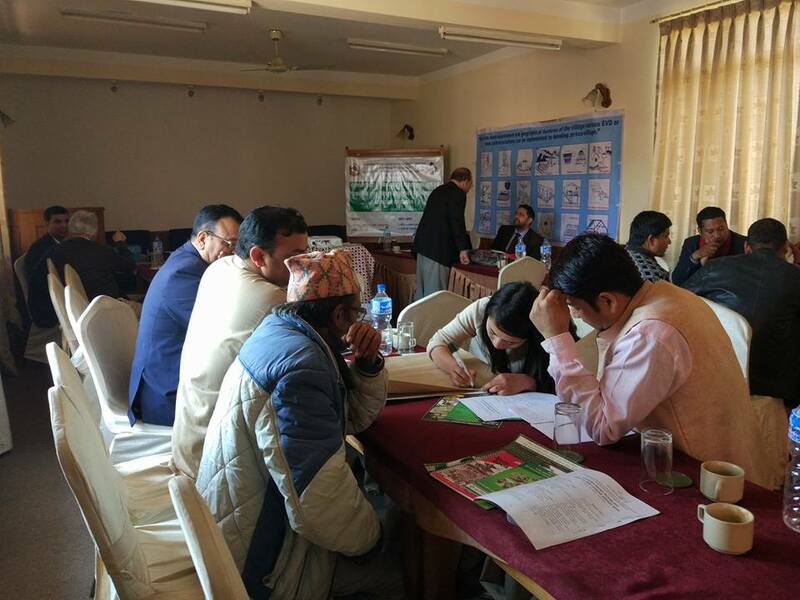 The organisations of INFORSE started cooperation on a joint project to strengthen the capacities of NGOs to incorporate sustainable energy into their work for poverty reduction. INSEDA and AIWC from India; IDEA from Sri Lanka; CRT from Nepal; Grameen Shakti from Bangladesh; Danish Organisation for Sustainable Energy (OVE); Danish International Settlement Service (DIB). Ruhul Quddus, Grameen Shakti, Bangladesh.